This is a simple, 6ft. 3.5mm audio cable. 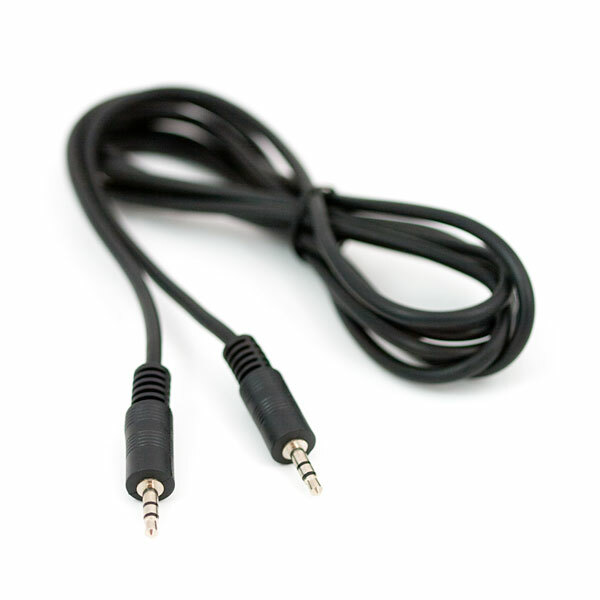 Commonly used with audio, this cable can also be used for really easy data transmission, as well as analog voltages. The connectors are common, the cables are common, this is a great way to get basic devices connected. Handy for use with the OLPC. I've got a pair of headphones that need a new plug, the old one got damaged, I kinda do want good audio quality. If all I use is the plug, does anyone think the plug itself plus an inch or so of the cable will cause noticeable interference? I mean, it's not like they're expensive headphones first place, so I probably won't be able to tell; and if it's bad I can just cut it off again a bit higher and replace it with one that's higher quality. Thoughts? If you're only using the plug, and not really any of the cable, then why not get just the plug? It would probably be easier to cut your existing cable, unsheath, and solder to that, then it is to splice the two cables together and keep them insulated properly (requires cutting at different lengths, some tape and/or heatshrink, and ultimately remains looking rather messy. I like the idea of using just the plug, and they're only $10 headphones, so they probably don't have very nice wire to begin with. Actually, it just so happens the headphones do only have one cable going to them as they are over the ear. For people posting on the audio quality - this is mostly for hardware projects where you'd want to connect analogue voltages easily. There's no shielding but this is perfect if you're planning on cutting it open to connect to sensors. Confirmed - no shielding, but they are cheap and the they work. I cut mine into two parts to make custom smartphone speakers for gifts. The three wires inside are red and white for audio channels, and a yellow for common ground. I do NOT recommend this cable. I bought 2 of them and will be mailing them back to Sparkfun tomorrow. Very poor quality, crackles and high-pitch hum when connecting XM radio or iPod to my car stereo aux jack. On one cable, the yellow inner wire is visible through the connector overmolding. I also suspected the shielding might be defective or just really low quality so I cut one cable open and there is NO SHIELDING! It's just 3 insulated wires inside a rubber overmold jacket. Yes, they were cheap - but, as ever, you get what you pay for. I'll be happy to pay a few more dollars for a decent quality shielded audio cable. Maybe you have a use for unshielded 3C cable, but it's definitely NOT the cable you want for audio or data hookups. I'm a bit disappointed that Sparkfun carries this item, I've been really happy with all the other products I purchased. Indeed. The quality is pretty bad. My cable stops working entirely sometimes. This cables are definitely not super high quality, but I've had no problems with the one I bought. I use it to go from my iPod/computer to my speakers and I've never had any problem with crackles/hum/audio quality. I wouldn't use it if I wanted high-quality audio on my home system, but for a pair of 10 dollar computer speakers that I needed a longer cable to reach, it did the job without any weird noises or problems!